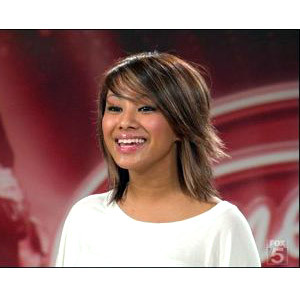 Nineteen-year-old Ramiele Malubay becomes the seventh Filipino-American singer who made it to the Top 24 of the No. 1 singing search in the world, American Idol. Another Filipino-American made it to the Top 24 of American Idol Season 7. Her name is Ramiele Malubay, 20. She auditioned in Miami, Florida. Ramiele is the seventh Fil-American who reached the Top 24 of American Idol, after Brad Estrin in Season 1, Jordan Segundo in Season 2, Jasmine Trias and Camile Velasco in Season 3, Jose "Sway" Penala in Season 5, and AJ Tablado in Season 6. However, only Jasmine Jasmine and Camile went on to compete in the Final 12. Jasmine finished third while Camile was the fourth to be eliminated. Fantasia Barrino was declared American Idol of Season 3. Ramiele, who is based in Miramar, Florida, wants to be the next Jasmine Trias and the first Asian-American to win American Idol. During her audition in Miami, Ramiele sang Aretha Franklin's "Natural Woman." Paula: "I think you are a fine singer and a fine performer... I think you're phenomenal." Simon: "I think you're a good singer. I don't think you're a contemporary singer. I think you're more like a hotel singer." Randy: "I actually thought you were good. I was impressed. You definitely have a big voice for a very cute, smaller girl." In the end, Ramiele got yes from judges Paula and Randy, but no from Simon. But that was enough to get her ticket to Hollywood where she joined over 160 other contestants. In Hollywood, those who made the first round went on to a series of auditions for the judges to decide who will make it in the Top 50. From these 50 remaining contestants, the judges finally picked the Top 24 contestants, 12 male and 12 females. These 24 hopefuls will perform live starting next week to determine who among them will make it to the Final 12. Aside from Ramiele, the other female contestants in the Top 24 are Joanne Borgella, Kristy Lee Cook, Amy Davis, Asia'h Epperson, Alexandra Lushington, Kady Malloy, Syesha Mercado, Amanda Overmyer, Carly Smithson, Alaina Whitaker, and Brooke White. The male contestants who made the cut were David Archuleta, Colton Berry, Robbie Carrico, Jason Castro, David Cook, Chieze Eze, Garrett Haley, David Hernandez, Michael Johns, Luke Menard, Danny Noriega, and Jason Yeager. American Idol airs locally on QTV-11 every Wednesday and Thursday at 6 p.m.